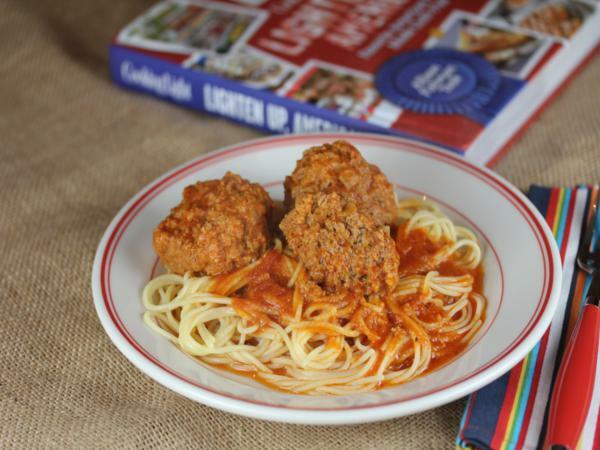 Last fall I received a cookbook from Cooking Light to review called Cooking Light Lighten Up, America! : Favorite American Foods Made Guilt-Free . The cookbook is filled with delicious foods from all across America. One of the things I instantly loved about this cookbook was all the pictures. I love cookbooks with pictures. In fact, always prefer cookbooks with lots of pictures. Looking through this cookbook will make you hungry. Everything looks delicious. From the blueberry cake to the vegetarian enchiladas, it all looks so good. I received this cookbook last fall and all through the holidays it sat on my desk. I kept looking through it, but never got around to making anything from it until a few weeks ago when I decided that it would be a good cookbook to highlight for my Cooking Through My Collection Series. I decided the first recipe I would make from it would be the meatballs and spaghetti. It has been quite awhile since I made meatballs and spaghetti, so I knew my family would enjoy having them again. There was a couple of things about this recipe that caught my attention. First of all it uses a combination of beef and pork. I love using a mixture of beef and pork for meatloaf and meatballs. It adds so much more flavor than just using beef. The other thing that I loved about this recipe was that the meatballs cooked in the pasta sauce. I like cooking my meatballs this way because it adds so much flavor to the sauce. And as long as you use lean meat you don’t add a lot of extra fat to the recipe. This recipe turned out delicious. I thought there would be plenty left over for lunch and there wasn’t hardly any at all left. My kids loved it, so I will be making this one again. And I can’t wait to do some more cooking out of Cooking Light Lighten Up, America! Heat oil in a pan. Add onion. Cover and cook over medium heat until tender. About 7-10 minutes. Add 1/4 cup water to loosen browned bits. Cook 7-10 more minutes, stirring frequently. Place marinara sauce in a large pan. Bring to a simmer over low heat. In a bowl combine onion mixture, basil, cheese, oregano, salt, crushed red pepper, and garlic. Add meat and crumbled bread. Stir gently, just enough to combine ingredients. Form into 2 inch balls and drop into marinara sauce. Bring sauce to a boil, cover, and reduce heat. Simmer for 30 minutes or until meatballs are done. While the meatballs are cooking, cook pasta according to package directions. 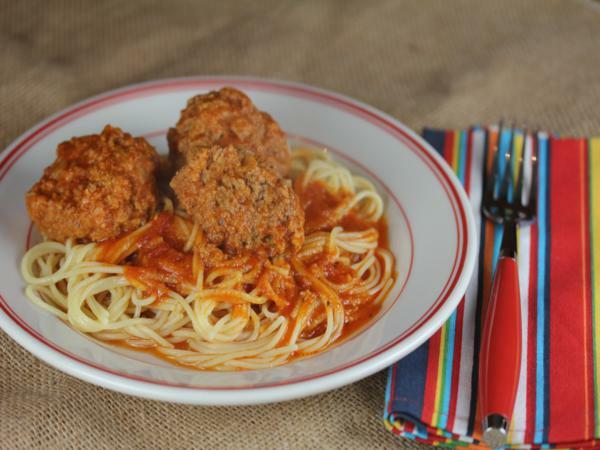 Serve meatballs and sauce over cooked pasta. Since you like the Cooking Light book with pictures, I thought you might also like some of my favorites-Good Housekeeping’s Illustrated cookbooks. They show a pic of every dish, categorized, in the front of the books and give you the page numbers. Most of the recipes are illustrated with graphics giving step by step instructions. I collect recipe books, especially old ones, just because they are interesting. My oldest is from 1870. My go tos are the Good Housekeepings. Thanks for the suggestion. I don’t think I have any Good Housekeeping cookbooks, so I am will have to keep my eye out for them.